I'm really like the way the warp and weft of the gauze are distorting. The gauze is both settling into the steps and pulling away. The horizontal areas are bunching up in the low areas and pulling apart over the high spots. The vertical pulling away from the steps. I would like to remove the gauze before it falls apart too much. I plan to hang the gauze vertically when it comes off the steps. Have to experiment with ways of either setting the distorted gauze in place or holding the gauze in place with a stable netting sewn into the gauze, or excepting that it will change again when hung. Oh well, I can try all. The basalt walls at Mount Tomah are constructed of mainly hexagonal or pentagonal blocks. 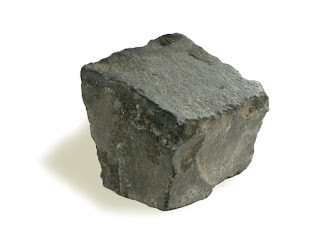 At the present basalt is sourced from a quary at Peats Ridge. There is a continuing building program. A team of stone workers are at present working on walls around the new education building. 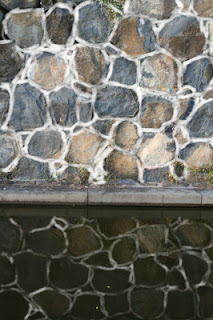 There are many older walls, one of my favourites is the wall behind the waterfall. Making the dark light, an idea for gauze. The lower steps in the garden have been built out of trachyte. Another volcanic rock. It was collected from the old Homebush sale yards in Sydney, when they we demolished. The trachyte is in square blocks. The grass was left uncut in a 'y' shape that followd the garden bed pattern as planned with Dave. This is the growth in about 5 days. As the time passes this grasses height will be more noticable and the varieties of grass in the lawn will hopefully become more distinctive. 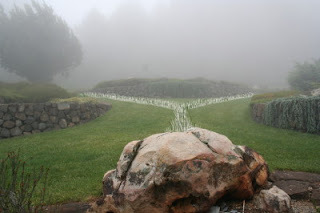 When I was invited to exhibit ‘Gathering’ and install gauze works at Mount Tomah Botanic Garden I was reminded of all my visits to the garden over the years. I recall the early days when we climbed a windswept bare hill. The energy in the wind could sweep away or invigorate. The site developed into diverse spaces, from the symmetrical formal garden, to the South garden (displaying plants which lie to the South of the equator) to the recent addition of the bog and all those wonderful spaces in between. Each area poses questions about environments. Each area informs and delights and is in constant change. The challenge of installing works in the garden is, to say something about the garden that adds to the garden, emphasises a characteristic, and enhances the experience of the visitor and the people who work in the garden. I aim to create work that takes the garden into the future, encouraging a dialogue that moves people into areas yet undiscovered and that pose questions and answers others. The Botanic Gardens Trust’s mission is ‘to inspire the appreciation and conservation of plants’ which is also one aspect of my practice. Installations in the garden will be developed from themes, materials that I am engaged with in my current practice. 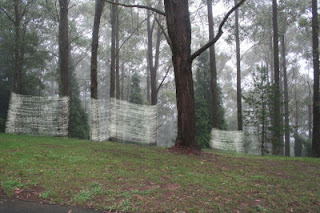 I have been planning gauze and grass works for Mount Tomah Botanic Garden to be installed from 2o-24 November, 2007. Walking around the garden with the different people who work at the garden or have connections to the garden is an experience in diversity. Each person has their own unique view and their own stories. This communicates a depth of understanding of the garden coloured by passion, alive and vibrant. With each journey you take a different path, see through others eyes and experience the garden in a fresh way. Thankyou for all the journeys so far and I look forward to many more. Stair series: The basalt work at Mount Tomah is one of the gardens features, making it 'Tomah'. The stairs series acknowledges the qualities of the basalt, an integral feature of the Garden. For me it has become part of the gardens identity. The garden is on a basalt cap. The soil has been formed through weathering of the basalt. The structure of basalt is often columnar, or shaped like a column. These short columns of basalt can be seen in the many walls around the gardens. 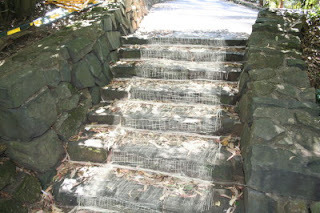 These stairs at the edge of the 'Forest Walk' have be be regularly blown clear of leaves. The next image shows the first plan for one of the stairs: the width of the gauze across the stairs will be less so that people have more room the walk on both sides. I also wanted to respond in Australia to the Italian project 'Walking on Art'. In common is the use of a volcanic rock as a paving material. 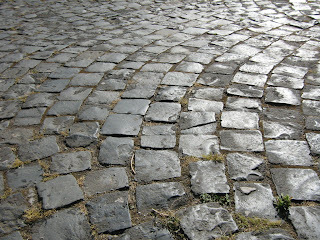 'Walking on Art' is a project which focuses on the "Sampietrino" (also known as "flints") the typical stone paving used for the first time at the end of XVII century in Rome at St Peter's square (from which it takes the name Sampietrino). It has been used in the construction of streets, courtyards and squares, in many Italian municipalities, European cities and recently also in some Japanese cities. There is a strong presence of the "sampietrino" in the "Lazio" area, particularly in the towns of the "Castelli Romani and Prenestini", because the roman "flints" are, in fact, lava fragments originating from the ancient "Vulcano Laziale". Today the "Sampietrino" runs the risk of being replaced by new modern material which is more suitable to modern life in the historic centres and more practical both for walking around and for the more silent transit of cars. Grass series: This plan for a Y of long grass in the middle of a mown lawn can be viewed from the Northern Pavilion as you look towards the African Heath. The Y echos the shape of the 'gauze cutting' which is the beginning of many of the gauze works. Check out this grass to find out how many different grass varieties make up this lawn and hopefully see at some stage how the grass looks when it is beginning to flower. A lawn like this is something many of us will never have in our own backyard. 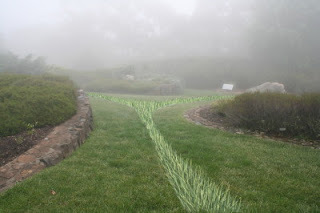 It needs watering, not as much as the formal garden lawn but watering and Mount Tomah gets more rain than many areas of Australia. Visit the rollypollie lawn in the Residence Garden- have a roll. The Eurasian Woodland: Tall Brown Barrels dot the slope between two people mover tracks. This is a steep slope, with a capopy high above. An area that people don't often walk into. 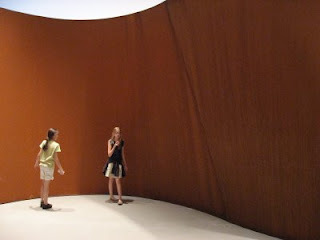 Gauze works will be installed from the top to the bottom of the slope forming spaces worth exploring. Gabriella emailed me these images: the works in the casuarina forest have been disturbed. Hannah and Joanna gathered the ends and tied and tucked them back into the gauze. They have become part of the Gathering, experiencing the feel of the gauze. Normally Hannah and Joanna would not have touched the work, I hope they enjoyed working with the gauze. The nature of the gauze is fragile, like our natural environment. The gauze can be leaned against gently, (only stretching it a little) if you are sensitive to the material. Go too far and it can break. It can be repaired, new patterns becoming established. Even with complete remaking it would not return to the original, it would have similar characteristics but always different, inconsistent. 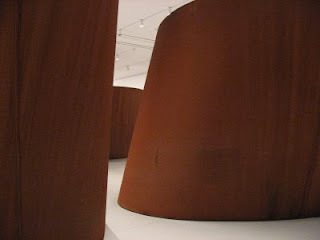 The following images and text from http://scoboco.blogspot.com/2007/06/richard-serra-at-moma.html led me to think about a series of short walls of gauze between trees creating passages that undulate: disrupting the rows in a pine tree forest or in a vineyard. 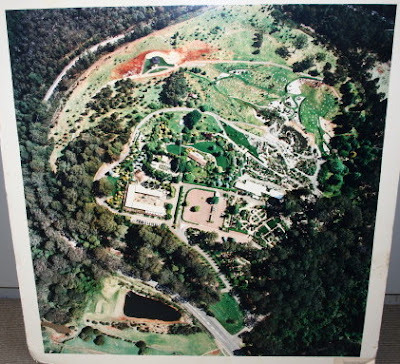 I will look for a site at Mount Tomah for this idea. One of these images is without people, the other with people in the space. 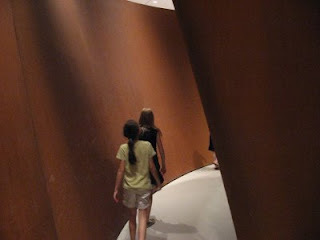 I am interested in how the inclusion of people in the space changes your viewing of the work. 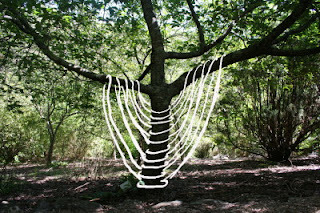 I will be installing site specific gauze works in the gardens. In the visitors centre I will have echidna works and grass seeds works including an animation. Some of the photos I have taken of the garden follow.